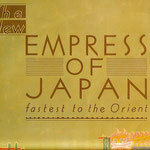 Empress of Japan - meherbabatravels jimdo page! 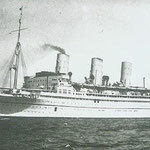 On June 11th at 7:45 A.M., Baba went for breakfast with Chanji and Tod to Mrs. Walter Dillingham's villa, La Pietra, on a hill near the area called Diamond Head. 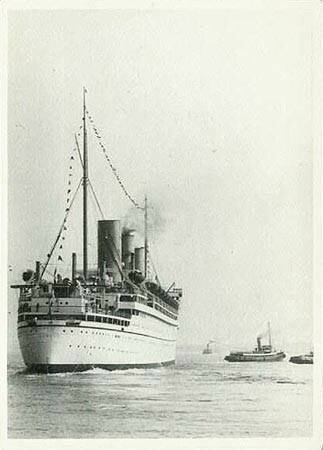 They left at nine o'clock to take Carl Phillips to his ship; Tod had to travel with the boy. 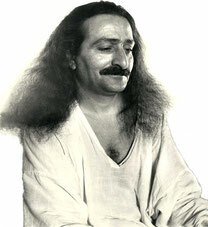 Carl appeared sad at leaving Baba, but true to Baba's prediction, it was later learned the boy did speak out against Baba when he returned. 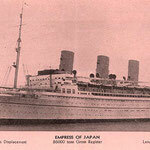 Soon after, Baba, Kaka, Chanji, Beheram and Adi Jr. set sail for China at noon on the Empress of Japan. 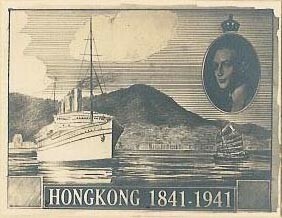 AFTER AN ELEVEN-DAY VOYAGE, they landed at 2:30 P.M. on June 22nd in Shanghai, China, where they were met by Herbert Davy and brother Jal. 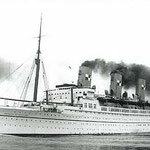 Dressed in a stylish suit and Panama hat, Baba disembarked and was driven a few miles to the Palace Hotel which overlooked the Huangpu River. 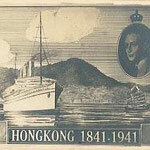 After tea, Baba indicated to Herbert, "I want to go out and mix with the Chinese, so take me to a place where there are thick crowds." 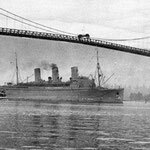 RMS Empress of Japan was an ocean liner built in 1929-1930 by Fairfield Shipbuilding & Engineering Company at Govan on the Clyde in Scotland for Canadian Pacific Steamships (CP). 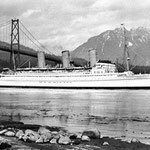 This ship -- the second of two CP vessels to be named Empress of Japan -- regularly traversed the trans-Pacific route between the west coast of Canada and the Far East until 1942. 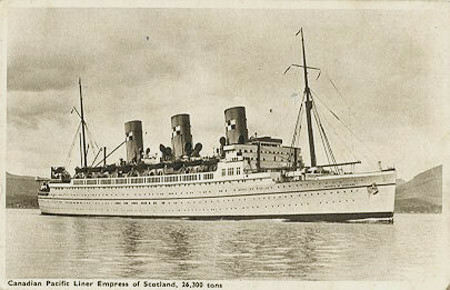 This Empress was distinguished by the Royal Mail Ship (RMS) prefix in front of her name while in commercial service with Canadian Pacific. 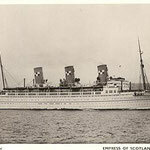 In 1942, she was renamed RMS Empress of Scotland -- the second of two CP vessels to be named Empress of Scotland. 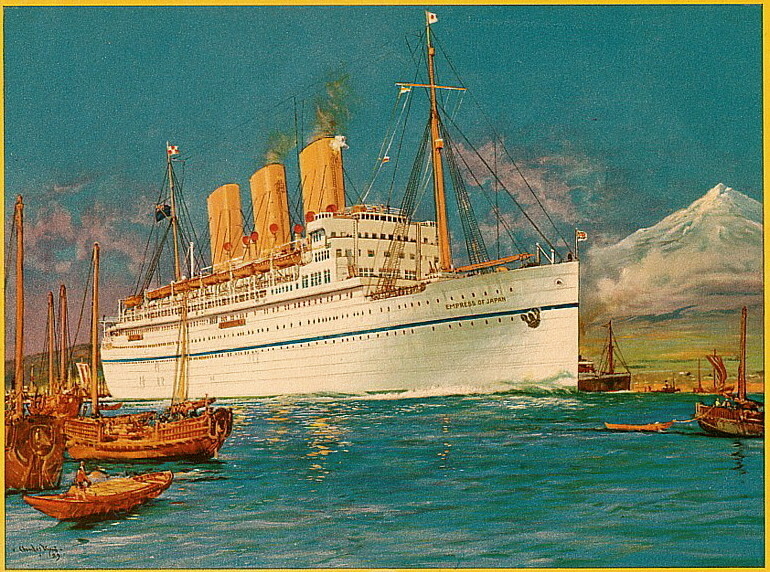 In 1957, the Hamburg Atlantic Line purchased the ship and re-named her SS Hanseatic. 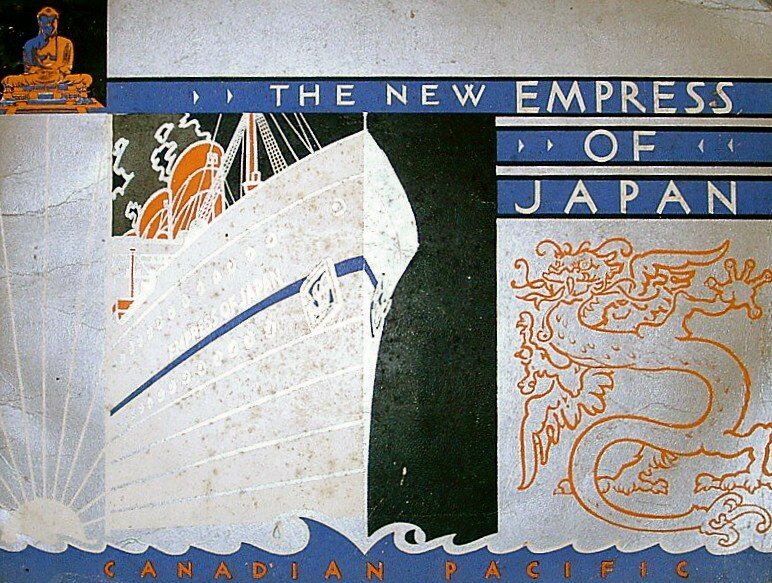 By the 1920s the Canadian Pacific conglomerate had established a sea/rail connection between Europe and the Far East. 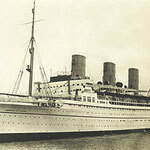 The company's steamships would carry passengers from Great Britain to Canada, the same company's railroad carried passengers across the North American continent to Vancouver, where passengers boarded another Canadian Pacific ship that would carry them to across the Pacific to Asia. 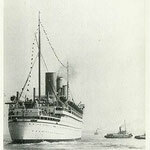 This was at the time the fastest way to reach the Far East from Europe. 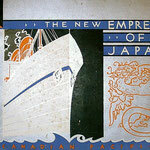 In the late 1920s Canadian Pacific decided to modernize their Pacific and Atlantic fleets, with the aim of reducing the journey time between Europe and the Far East by two days. 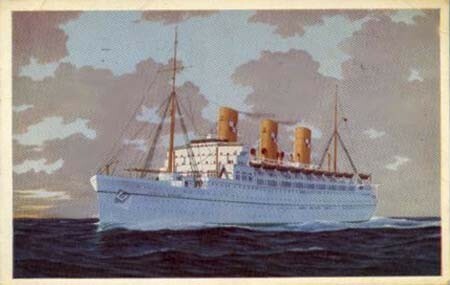 The new liner intended for the transpacific service was envisioned at approximately 25,000 gross register tons, 203.05 m (666 ft 2 in) in length and capable of carrying 1173 passengers in four classes. 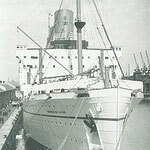 Construction of the vessel was awarded to Fairfield Shipbuilding & Engineering Company at Govan near Glasgow in Scotland. 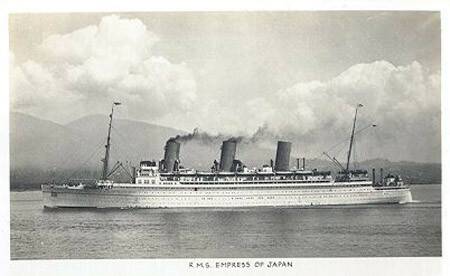 She was launched on 17 December 1929 and named Empress of Japan. 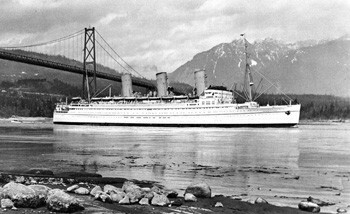 Originally Canadian Pacific had planned on constructing a sister ship for her for the Pacific service, but due to the Great Depression the second ship was left unrealized. 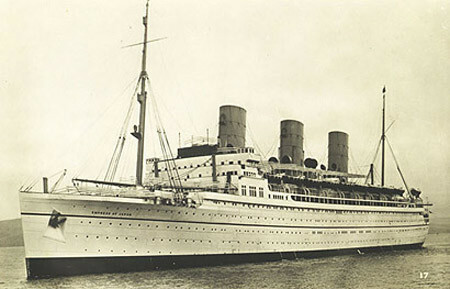 Instead, the company decided to concentrate their resources on the Empress of Britain, a larger version of the Empress of Japan under construction for their trans-Atlantic service. 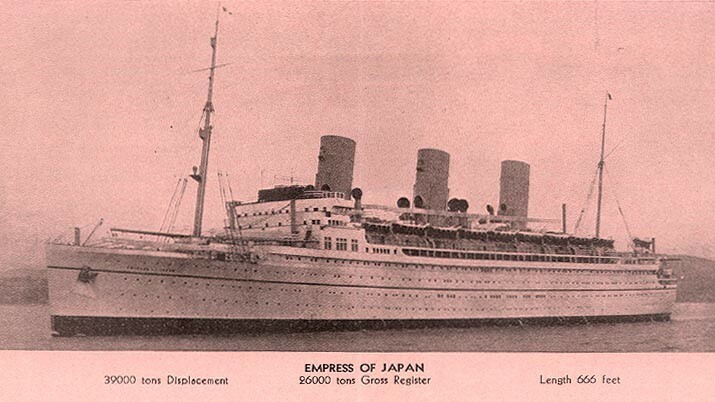 Due to the similarity in design of the two new Empresses, they were essentially interchangeable, despite the Empress of Britain being approximately 16,000 GRT larger than the Empress of Japan. 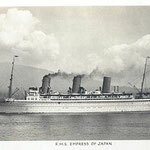 The Empress of Japan carried out her sea trial successfully in May 1930, achieving a top speed of 23 knots; and on 8 June 1930, she was delivered to Vancouver for service on the trans-Pacific route. 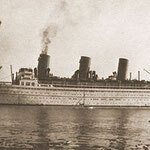 In this period, she was the fastest ocean liner on the Pacific. 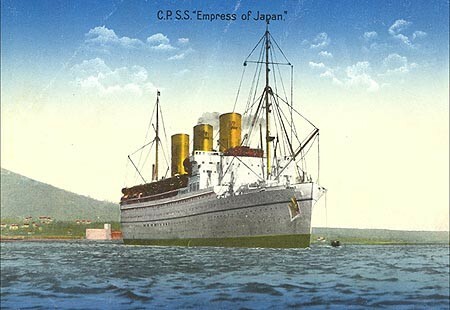 Due to being a part of Canadian Pacific's service carrying Royal Mail, the Empress of Japan carried the RMS (Royal Mail Ship) prefix in front of her name while in commercial service with Canadian Pacific. 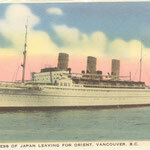 She would continue sailing the Vancouver-Yokohama-Kobe-Shanghai-Hong Kong route for the rest of the decade. 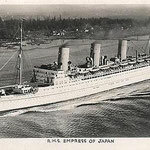 Amongst her celebrity passengers were a number of American baseball all-stars, including Babe Ruth, who sailed aboard the Empress of Japan in October 1934 en route to Japan. 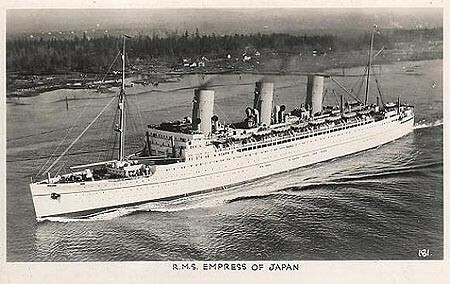 The outbreak of war in Europe caused the Empress of Japan to be re-fitted for wartime service. 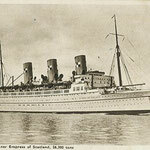 SS Empress of Scotland with her decks filled with fighting men. 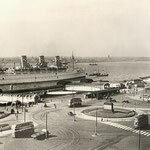 This in-port photograph allows a close view of the ship's construction when ship still had three funnels -- circa 1940s. 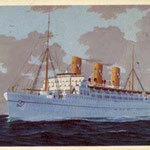 Following the Japanese attacks on the Empire outposts in the Far East in December 1941, the name of the ship needed to be changed. 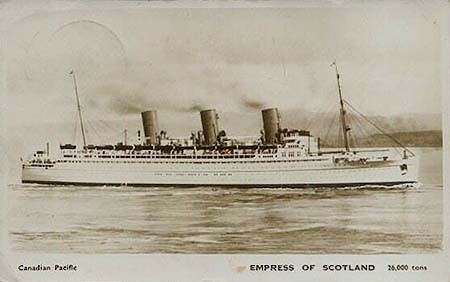 In 1942, she was renamed the Empress of Scotland. 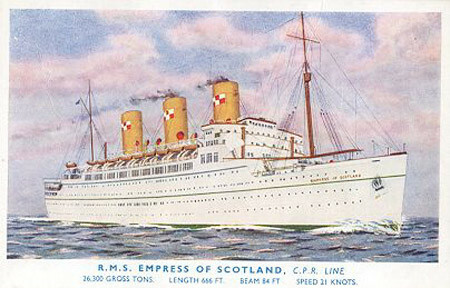 Following the end of World War II, the Empress of Scotland was needed to meet the newly developing demands for trans-Atlantic passenger service. 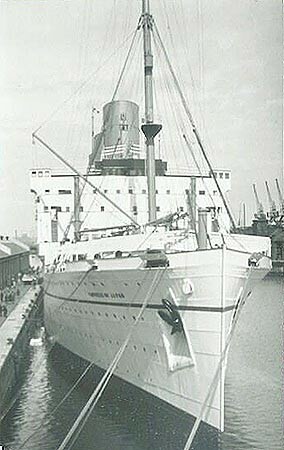 In the period between 1948 and 1950, she was rebuilt at Fairfield in Glasgow. 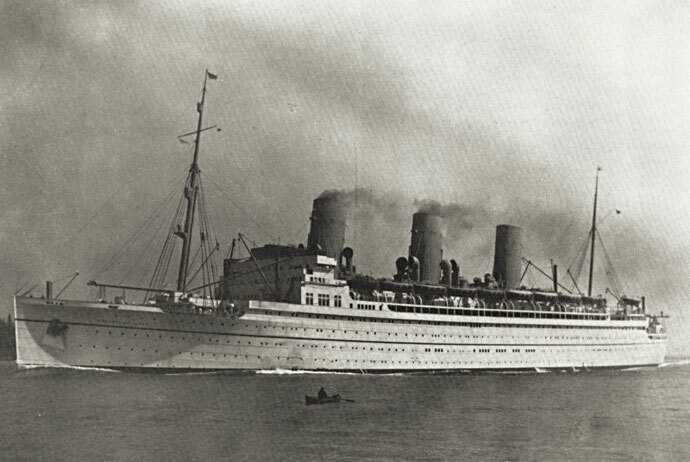 These modifications were necessary to better meet weather conditions on the colder Atlantic route. 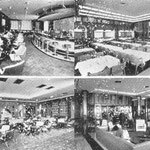 This extensive re-fitting included a radical reconfiguration of her cabins from the original four classes to just two — first and tourist. 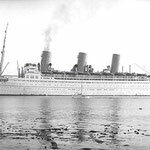 The Canadian Pacific Empress completed her last trans-Atlantic crossing in 1957; and she was temporarily laid up in Belfast until being sold. 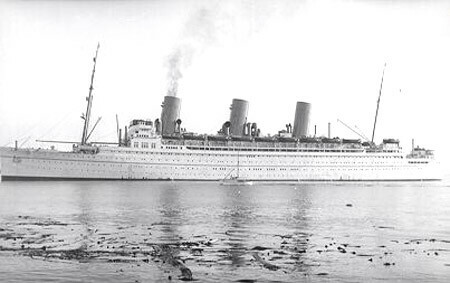 SS Hanseatic photographed circa 1963. 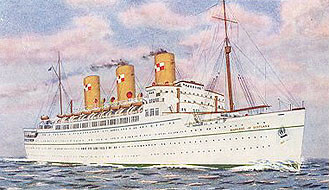 Following her sale to Hamburg Atlantic Line in 1958, the ship was radically rebuilt to meet the expanding market for trans-Atlantic passenger service. 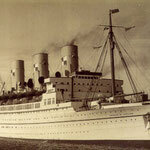 The ship's superstructure and funnels were rebuilt and her passenger accommodations were re-configured. 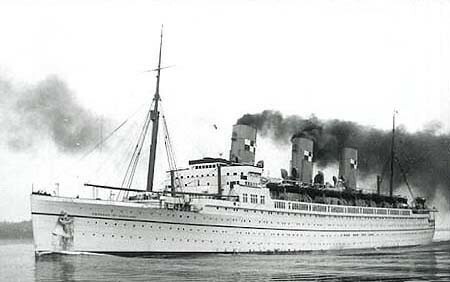 The vessel emerged as the 30,030 GRT SS Hanseatic. 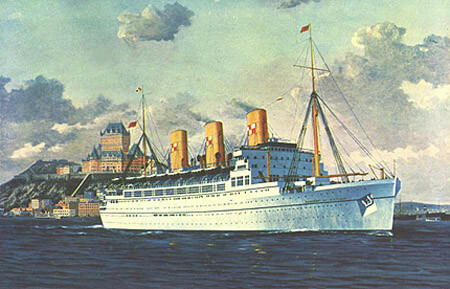 The re-named and re-flagged ship was designed to carry as many 1350 passengers in comfortable luxury on the Hamburg-New York route. 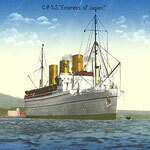 ^ The first SS Empress of Japan (1891) was built for CP to sail the trans-Pacific route. 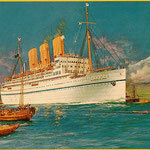 ^ The first SS Empress of Scotland (1906) was built for HAPAG, purchased by CP in 1921, then re-named. 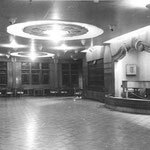 ^ a b Miller, William H. (1995). 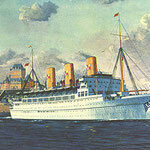 The Pictorial Encyclopedia of Ocean Liners, 1860-1994, p. 46. ^ Sharp, PJ. 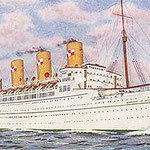 "White Empresses". 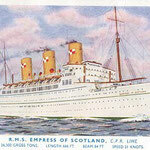 Empress of Scotland: An Illustrated History. 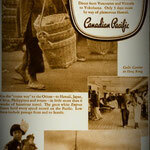 http://www.angelfire.com/pe2/pjs1/eos2.html. Retrieved 2008-03-02. ^ Johnston, Ian. 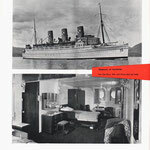 "Govan Shipyard" in Ships Monthly. 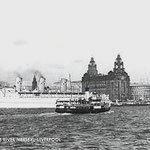 June 1985. 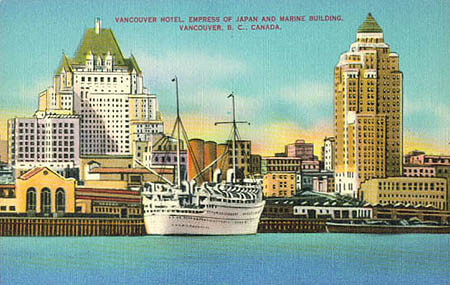 ^ Dawson, Philip. (2005). 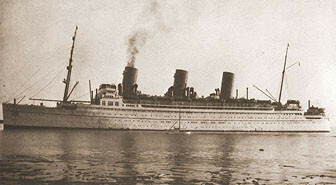 The Liner: Retrospective and Renaissance, p. 85. 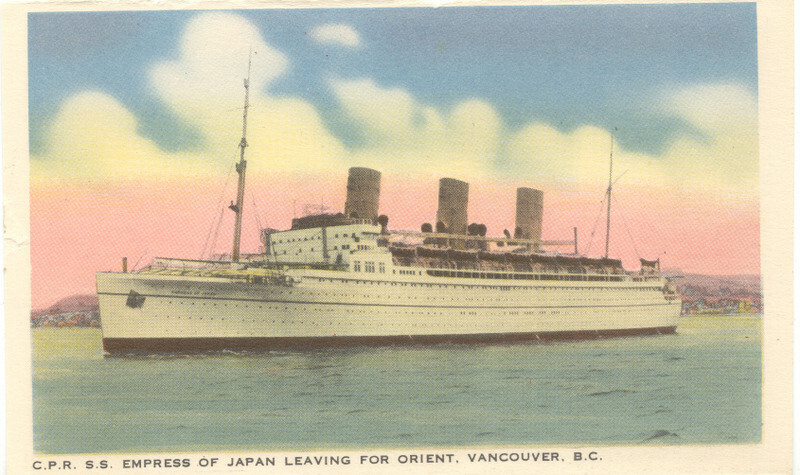 ^ City of Vancouver archives: "American baseball stars, including Babe Ruth, visit 19 October' Leaving on "Empress of Japan" 20 October 1934." 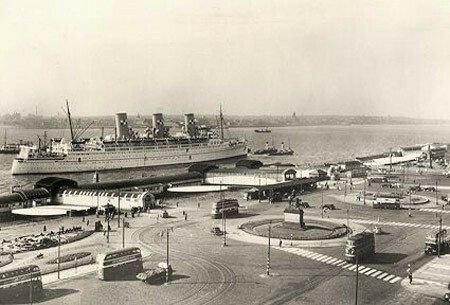 Stuart Thompson collection, 1934. 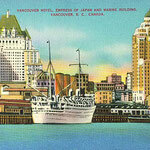 ^ Miller, William H. (1988). 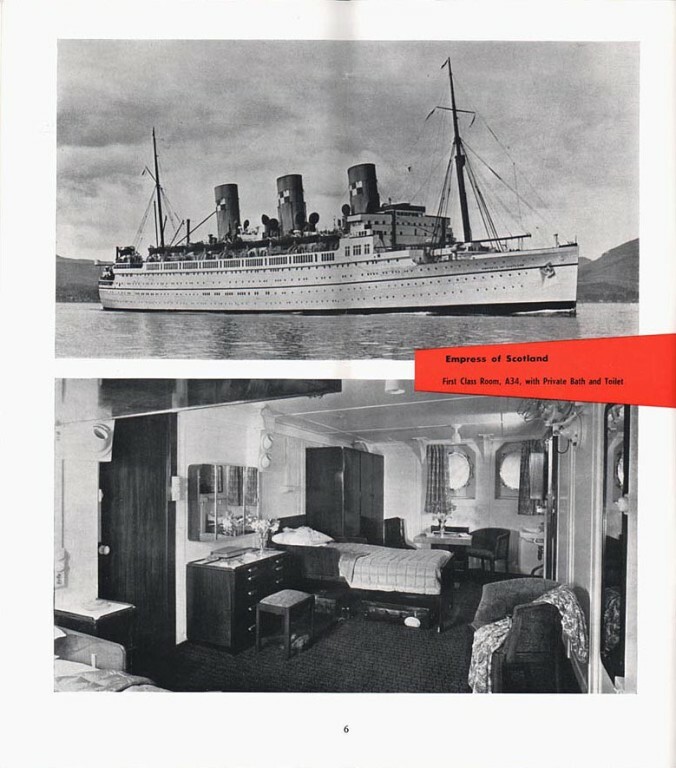 Great Ship and OCean Liners from 1954 to 1986: a Photographic Survey, p. 61. ^ Sharp, PJ. 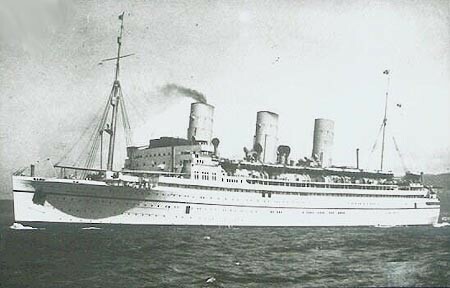 "Transatlantic". 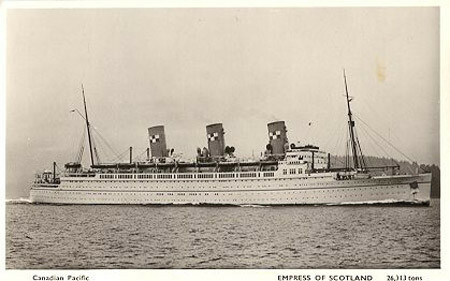 Empress of Scotland: An Illustrated History. 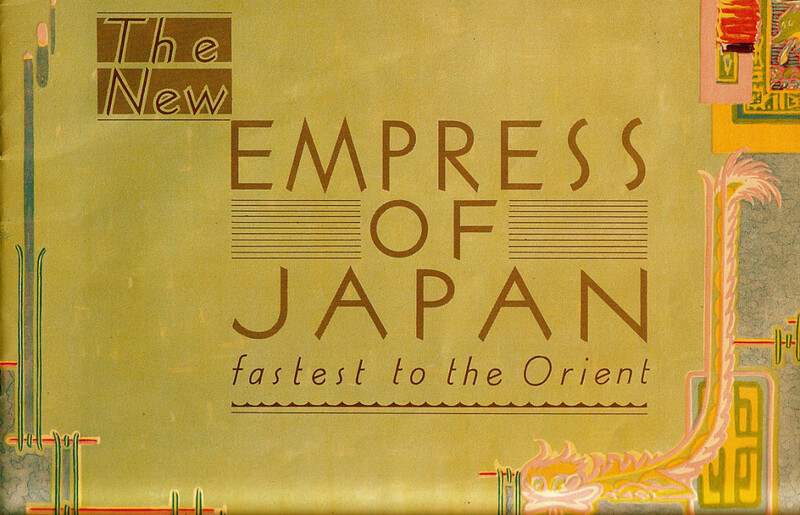 http://www.angelfire.com/pe2/pjs1/eos5.html. Retrieved 2008-03-02. ^ Sharp, PJ. 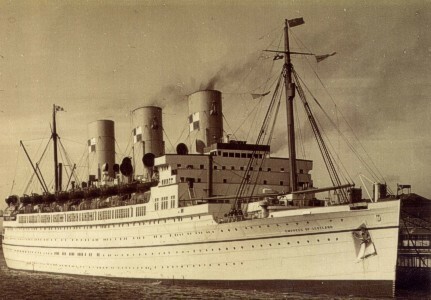 "Hanseatic". 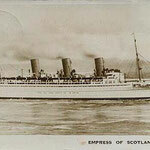 Empress of Scotland: An Illustrated History. 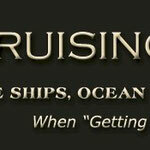 http://www.angelfire.com/pe2/pjs1/eos8.html. Retrieved 2008-03-02. 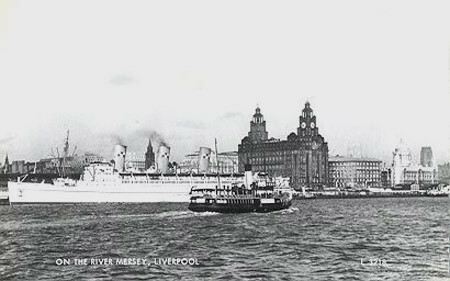 Johnston, Ian. 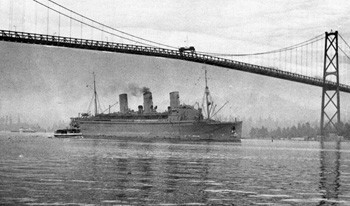 "Govan Shipyard" in Ships Monthly. 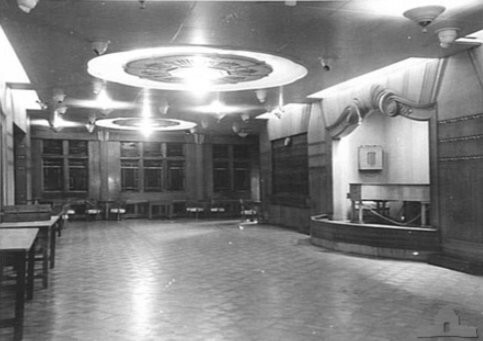 June 1985.